San Francisco’s top law enforcement official launched an investigation into what he calls “troubling charges” of wrongdoing at the sheriff’s office and police department. District Attorney George Gascon’s investigation is not being received favorably by the agencies he’s planning to investigate. Police Chief Greg Suhr says it’s an election year, while Sheriff Ross Mikrarimi and Public Defender Jeff Adachi say they want an independent agency to investigate the crime lab. Gascon says his task force will look into inmates in the county jail accusing sheriff’s deputies of forcing them to fight other prisoners. The probe extends to the police department, that’s embroiled in its own scandal including racist text messages that cops were exchanging with former Officer Ian Furminger, who was convicted of public corruption. And now there’s an investigation into the SFPD crime lab. A criminalist has been charged with altering DNA evidence two years ago, which led to a conviction in a criminal trial involving San Francisco Police Corruption. In 2010, drug testing at the crime lab was shut down when criminalist Deborah Madden admitted she stole cocaine evidence for her personal use. 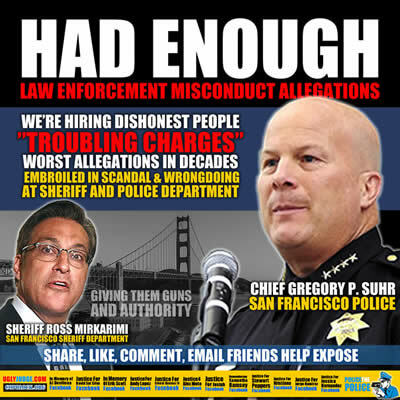 The scandal forced prosecutors to dismiss more than 1,000 cases due to San Francisco Police Corruption. And now there are questions over the criminalist’s competency as a DNA analyst. Documents show she flunked a regular proficiency test last August and her supervisor failed to catch it.